After discussing 360 video capture and 3D modelling in a previous blog post, we now introduce two other techniques for capturing 3D environments, 3D scanning and photogrammetry. 3D Scanning is an approach commonly used in architectural and geospatial surveying. It involves the use of professional equipment which measures the distance of objects using a laser beam and yields a “point cloud” where each point corresponds to a laser measurement. This distance information can be combined with data from a camera to measure the colour of each point. Measurements are very accurate and the equipment involved is expensive, although it can be rented rather than bought. Only objects within the line of sight of the scanner can be captured, although measurements from multiple points can be combined to mitigate that. The output being a series of discrete points, surfaces and textures tend to lack realism, and volumes may appear as being hollow. 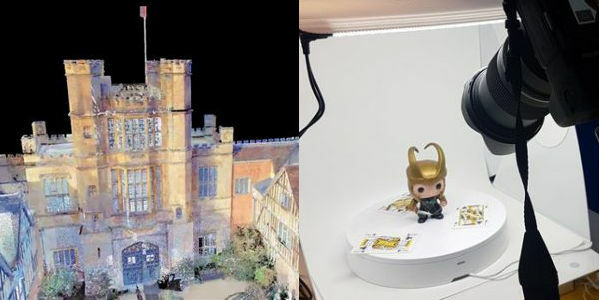 The Nottingham Geospatial Institute, part of the Faculty of Engineering, operates Leica laser scanners, and have used them to produce detailed models of historical buildings, including Lincoln Cathedral and National Trust property Coughton Court in Warwickshire, the latter revealing a secret room used by priests hiding from religious persecution. Photogrammetry involves taking a series of 2D images of an environment from multiple angles, and stitching them together through an algorithm that will detect and recreate the volume of the environment. This method is cheap (it can be done with a consumer grade camera provided that there are good lighting conditions), but less accurate than scanning. It doesn’t work well with reflective surfaces and requires that no object moves while the scene is captured. This method is computationnally intensive, and it will take several hours to move from a series of still images to a 3D model. It also suffers from the same line of sight limitations as 3D scanning. Horizon Centre for Doctoral Research‘s Dimitrios Darzentas has used photogrammetry to engage with audiences at the National Videogame Arcade and help them scan, and create digital footprints of, their wargaming figurines. This blog is part of a series on Virtual Reality and Sensory Science.